These first four "30 for 30" films have all been tragedies in some way, and "Muhammad and Larry" is the grandest tragedy yet. The timeframe of the series (which has to cover events from ESPN's lifespan) means we can't get a film about Ali when he was The Greatest of All Time, when he was faster, and funnier, than any other fighter on the planet. 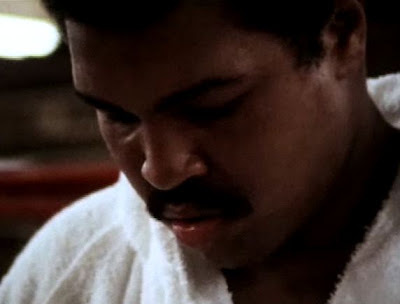 Nor can we see the Ali of the '70s, who had slowed down but gained in toughness what he lost in speed, and who survived legendary slugfests(*) with George Foreman and Joe Frazier. There are traces of that man in "Muhammad and Larry," particularly in the snippets of him bantering with the visitors to his training camp (and in magic trick sequence, which becomes incredibly poignant when you realize the Parkinson's has robbed him of the ability to even do something as silly as sleight-of-hand), but this is an older, slower Ali. (*) The great irony of The Rumble in the Jungle is that, by winning through his ability to take a punch, rather than his ability to dodge one, Ali set himself up for all the brutal hits that would lead to Parkinson's. The Holmes fight was just the most infamous example of it, but the man took a savage beating for almost a decade. And those classic Ali fights have been well-covered by the dozens of Ali documentaries and books out there (HBO did a terrific Thrilla in Manila film earlier this year), whereas Albert Maysles' footage of the build-up to Ali-Holmes sat on a shelf for decades, because no one wanted to revisit the horror of that one-sided demolition of the beloved Ali. Then "30 for 30" came along, and Maysles' archival footage was combined with contemporary interviews(**) - shot by Maysles with help from co-director Bradley Kaplan - and so we get to see the car wreck of a fight unfold in slow motion. We barely see any of the fight itself, but there's such a sense of dread over the build-up footage, and such regret in the voices of most of the 21st century interviewees, that we only need a few glimpses to recognize how awful this was, and how sad that nobody could talk the champ out of it. (**) One of the contemporary interview subjects is Star-Ledger sports columnist emeritus Jerry Izenberg, who appears in all the Ali films because he's one of a small circle of guys who was close to the champ in those days. (He's also one of a handful of writers to have covered every single Super Bowl in person.) I would never want to be a sportswriter today, not least because of the whole "no cheering in the pressbox" thing, but the access that guys like Jerry got back in his heyday was really remarkable. "Sportswriter in the 1960s" is definitely one of the dream jobs at the top of my list should I ever finish my time machine. At the same time, "Muhammad and Larry" manages to tell the ultimately happy story of Larry Holmes. Holmes never got much respect as champ, in part because everyone felt bad about the whupping he laid on Ali, in part because he was a fairly bland, unassuming guy compared to Ali, Frazier, Foreman and the other men who had dominated the heavyweight ranks for the previous two decades. But it feels oddly refreshing to see a relatively well-adjusted champ, one who gets so much obvious, simple pleasure out of listening to songs written about him, and who's perfectly happy to still be living in his hometown of Easton. Only three more of these films to air by the end of '09: next week's "Without Bias," then "The Legend of Jimmy the Greek" on Nov. 10 and "The U" on Dec. 12. I have the first two of those and hope to watch them soon, so the plan will be to keep writing each film up as it airs. Longtime reader, 1st time poster. I thought the movie was riveting and sad. Ali being so delusional was frightening to watch. I look forward to watching more of these if the subject matter is interesting to me.Thanks for the great stuff you write on Mad Men, Breaking Bad, and Lost. Your columns are the first thing I read after watching those shows. I can't believe Ali fought another fight against Berbick after his fight with Holmes. How could his advisers let him do that? How could his advisers let him do that? This may seem strange thought, but watching Ali reminded me of Elvis in the last years. Elvis was shot; he was bloated, fat, slurring lyrics and forgetting songs because of the drugs. He was well past his performing career and yet his managment and hanger-ons kept pushing him out on the road till he was dead. Watching Ali it was obvious the damage had already been done and in a sense he died a cruel metaphoric death. He may be alive, but the articulate, beautiful Ali was gone. It is a story as old as civilization itself. I thought the subject of this doc was fascinating and the footage was great, but the film's pace was too slow. Things definitely dragged in the middle, watching Ali and Holmes prepare for the fight. This footage felt tired after seeing so many similar films about the lead-up to big fights, like "When We Were Kings." I wish more of the film had been spent on the fight's immediate aftermath and media coverage. I'm in my early 20s, and my best/only memory of Ali is lighting the torch for the '96 Olympics. However, I've heard plenty from my Dad and other older people. I thought this film was riveting, like John said. It was easy to tell how much Ali as an icon. 1. Holmes saying Ali loved you - as long as he was "up here" and you were "down there". 2. Holmes openly crying after being forced to punish Ali, then visiting the bedridden champ. What did Ali do? He joked around and made the shaken Holmes feel better. That was a compassionate thing to do and says a lot about what kind of man Ali is. Agree with Mark above. My jaw dropped with the note that Ali fought Berbick after this decimation. Alluding back to "no rooting in the pressbox", Howard Cosell definetly broke that rule as this particular fight's announcer. You truly got the sense of how close he was to the champ. For a man who sometimes cruelly crossed the line between prefight hype and personal insult, I was struck by Ali's comment in the limo after Maysles brought up Holmes. As you noted, Alan, it seems like Jerry Izenberg is in a thousand of these shows, yet he always has a fresh and informative contribution. It's understandable that Holmes was overshadowed on one end of his career by Ali, a giant in and out of the ring. But he was overshadowed on the other end by Mike Tyson, who had some thrilling knockouts but relatively meager boxing accomplishment and awful personal problems. People wonder why fighters and other athletes can't take their huge winnings and retire quietly and comfortably in a stable relationship. Holmes did just that and is largely unknown to the public these days. On the other hand, it seems like everything Mike Tyson does still makes headlines. I don't think this was the best made doc, but the subject was interesting and the footage amazing. I've never really seen the older side of Ali before, but it's fascinating to see that even in his old age he lived to entertain. That "sense of dread" is almost how I felt about watching this. Excited to see the footage but dreading it as well because I knew the fight doesn't end well. I never saw the Holmes-Ali fight but I've heard about it and knew it was the end. (Wait, he fought again after this?!?) I had heard the sound-bite of Cosell saying "Oh, he's ready to go now" but that's about it. The thing that really struck me though was I just watched Ali with Will Smith a couple weeks ago. To go from that vibrant version to this one where you can see how much slower he's moving... how much slower his speech is... How could the people around him not see it? It made me question for just a minute if the movie overplayed Ali's personality. Sadly, no they didn't. Anyone know where I can watch this? I guess it comes on replay a bunch of times. So I will look for it on the DVR. But I missed a few, especially the Colts marching band. Wouldn't mind a purchase on iTunes. So far, iTunes has only "Kings Ransom" available for download. And at a listed $4.99, that feels a bit steep for an hour-episode. I liked it a lot but would have loved to see some more post-fight Ali footage to compare what the fight did to him. thought it was sad no one really stepped up to Ali and made him stop. So many people getting paid by him and hangers on - looked like a village of folks sponging off him in Deer Lake. His business manager in the round table practiced a little revisionist history during the neurological test scene. Pacheco left his camp several years before. Not sure how accurate his memory is but he seemed to be the only guy saying stop but wasn't around at the end.